Measurements Lens Width: 54mm Lens Height: 33mm Bridge Width: 18mm Arm Length: 140mm Frame Width: 138mm Details Gargoyles Rover Blue Gender: Male Manufacturer: Gargoyles Material: Acetate Color: Blue Polarized: No Progressive Eligible: Yes Gargoyles Rover Blue eyeglasses are light and minimalistic. 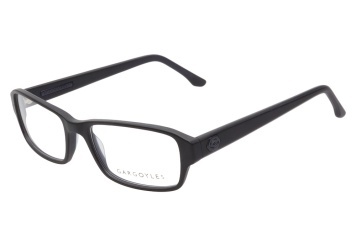 This bare style comes in matte black acetate with classic rectangular shaped lenses. The tapered temples are sleek and understated. Accented only with a satin metallic blue Gargoyles logo by the hinges. Try them on today, right here on ViewTry.